The experts, parents, educators and architects will discuss “why risky play is important”. Foreign panelists include Bianca Elgas, CEO of Kukuk Kultur, which develops, plans and builds Europe’s unique experience, play and outdoor spaces for people of all ages; and Sarah Kassler, co-owner of Sensomoto, an atelier that focuses on the benefits of interaction between people, public space and nature. The professionals will share their hands-on experiences and insights about risky play in their countries with modern educational theories. “This seminar offers an opportunity for participants to get into a dialogue with our guests on issues of life skills development, and more importantly, ways to engage children to develop in harmony and happiness,” said Nguyen Tieu Quoc Dat, one of the panelists. 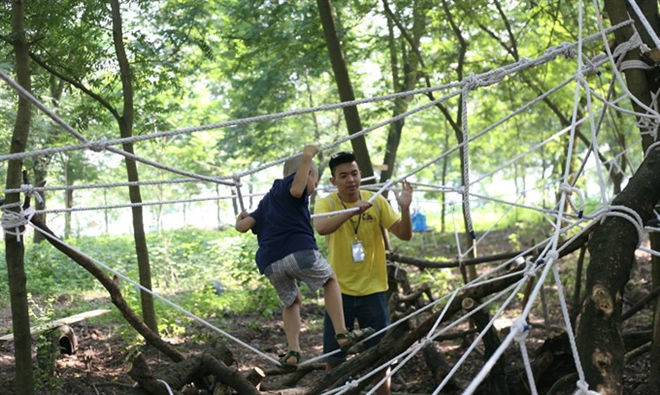 “Social and environmental factors are impacting children’s opportunities for outdoor risky play, said Dat, co-founder of Think Playgrounds (TPG), an organisation on a mission to create public spaces for children in Vietnam. Children today spend more time watching television and playing indoors than they do being physically active outdoors. Parents are often too concerned about traffic, the threat of kidnapping and other dangers to allow their children to ride bicycles, play outdoor games or explore outdoor areas. “This safety-obsessed society will result in children who are less physically fit, have little control over motor skills, and are less able to manage risk,” he said. The seminar will take place on October 6 at the Hanoi Goethe Institute, 56-58 Nguyen Thai Hoc street. Then the professionals will work with community in Dong Anh district on the outskirts of Hanoi to design a risky playground on October 7. This seminar is part of a series of events called the Play Campaign which aim is to build a dialogue with the community about the importance of playing for the mental and personality development of Vietnamese children. The programme is supported by Think Playgrounds, Live and Learn for Community and Environment Centre, Ford Vietnam Company Limited, L’Espace, the Goethe Institute and the Franco-German Cultural Fund.